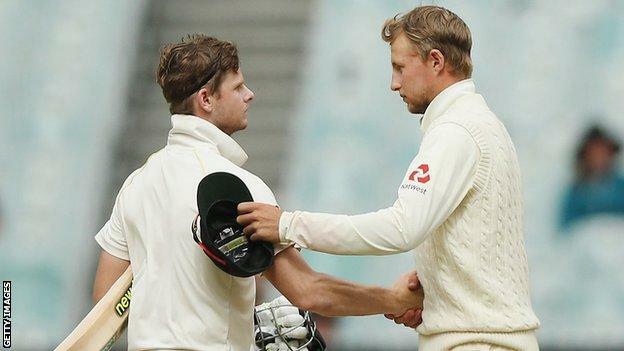 England were denied by yet another century from Australia captain Steve Smith as the fourth Ashes Test ended in a draw. Smith batted throughout the final day in Melbourne for 102 not out, his third hundred of the series. The tourists had hope of victory when David Warner and Shaun Marsh fell in the space of six runs to leave Australia 178-4, only 14 ahead. But Smith combined with Mitchell Marsh on a lifeless, turgid MCG pitch to take the home side to 263-4 – 99 in front – when the teams shook hands. 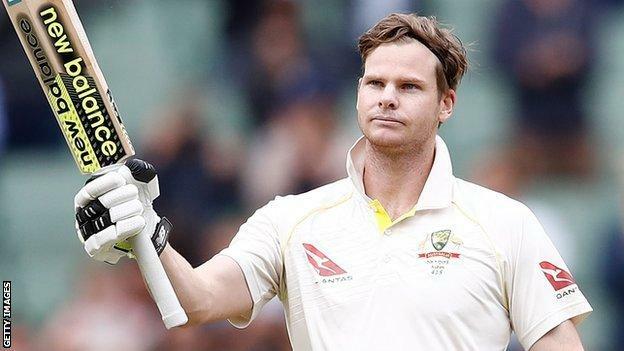 Australia had already regained the Ashes and remain 3-0 ahead going into the final Test in Sydney, which begins on 4 January. Although England have not won a Test down under since 2011, they ended an eight-match losing streak and avoided an unwanted piece of history – they had never before lost nine in a row in Australia. Australia’s chances of earning a second successive home whitewash, and third in 11 years, are also over. When Australia resumed on 103-2, Warner reprised the restraint he showed on a rain-shortened fourth day – the 161 balls he took to reach 50 was his slowest half-century in Test cricket. However, after the left-hander began to score more freely, he played an awful lofted drive at Joe Root’s off-spin and skied to James Vince at short cover to depart for 86. Soon after, Shaun Marsh was brilliantly caught one-handed by wicketkeeper Jonny Bairstow off Stuart Broad. Smith, though, was immovable – patient, serene and eager to cash in on a surface that remained friendly to batsmen throughout. As England went through plan after plan and begged the ball to move off the straight, the home skipper played pulls and deflections behind square on the leg side, or the occasional drive through the covers. 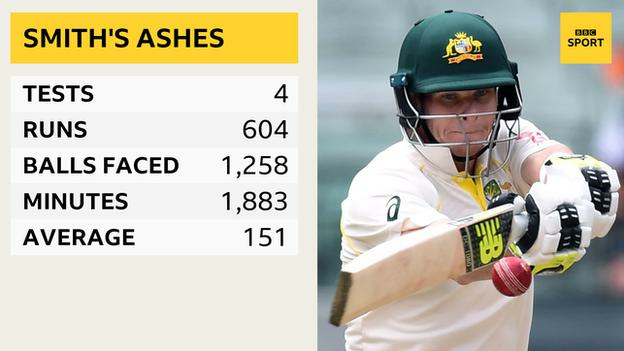 In moving from his overnight 25, he ticked off the milestones: the first Australian for 15 years to make three hundreds in an Ashes series; the first for 23 years to rack up 600 runs; more than 200 overs faced in the first four Tests of the series. By the end, he had his fourth successive century in Melbourne Tests and had spent more than 31 hours at the crease during the series. Mitchell Marsh began with uncertainty, almost driving Broad to Vince at deep gully, but grew into defending with a straight bat and a big stride. His 29 not out came from 166 balls. In 48.2 overs together, Australia’s fifth-wicket pair sapped all life from a contest that was going through the motions long before the end was agreed. This was a good response to losing the Ashes by England, who have been whitewashed on the past two occasions they have found themselves 3-0 down after three matches in Australia. Their bowlers fought back from Australia reaching 102-0 at lunch on the opening day to dismiss the hosts for 327, then Alastair Cook returned to form with 244 not out – the highest score by a visiting batsman at the MCG – in the tourists’ 491. England were aided by the absence of Australia fast bowler Mitchell Starc through injury, but Root’s men have been harder hit by unavailability and injury in this series. In the end, they were beaten by the weather – half of day four was lost to rain – and, more importantly, an unresponsive pitch. England’s quartet of seamers were wholehearted and skilful enough to find the occasional hints of reverse swing, but it was not enough to take 20 wickets for the first time in the series. They remain without a victory in Australia for seven years. If they fail to win in Sydney, that wait will be more than a decade by the time they return in 2021. England will have a decision to make on Moeen Ali for the match at the Sydney Cricket Ground. The all-rounder averages less than 20 with the bat in this series and has taken only one wicket with his off-spin since the first Test in Brisbane. That part-time leg-spinner Dawid Malan was at times employed instead of Moeen on the final day shows how much faith England have lost in a man who has 131 Test wickets. England captain Joe Root: “We played really good cricket over five days. It is frustrating that we have not managed to force a win. Australia captain Steve Smith: “It was nice to be there at the end. We would have liked to have won the game but today that wasn’t an option. It was about grinding it out. Melbourne Cricket Club chief executive Stuart Fox: “While this Test pitch did produce a good contest, it has not contained the pace and bounce that we expected.